Intensity-modulated radiation therapy (IMRT) is now one of the most common external beam radiation therapies used to treat cancer. The multileaf collimator (MLC) system is a vital component of the treatment head that allows for the delivery of the complex radiation fluence patterns that make IMRT possible., In our clinic, Elekta MLCi2 (Elekta Corporation, Stockholm, Sweden) was installed on six Elekta Synergy Linear Accelerators (linacs). One important characteristic of the MLC modeling in the treatment planning system (TPS) is the transmission of radiation through MLC. MLC transmission generally has two components, the radiation that is transmitted through and attenuated by the full thickness of the leaf, and the radiation that is transmitted through the space between adjacent leaves. The Philips Pinnacle 3 TPS (Philips Medical Systems, Andover, MA, USA) allows the user to specify a leaf transmission factor for each X-ray beam energy. The user may also configure the model to characterize the additional interleaf transmission, but this can only be done for all the X-ray energies of a machine simultaneously. The leaves of the Elekta MLCi2 treatment head, as well as most commercial MLC systems, come equipped with rounded leaf ends, the purpose of which is to provide a relatively consistent radiation penumbra width at all possible leaf positions. X-rays from the radiation source impinge on the rounded leaf ends at various angles depending on the position of the leaf. This results in a leaf-position dependence on the relationship between the projected leaf tip position and the projected light field position or the projected radiation field edge position (defined in this work as the point at which the dose reaches 50% of the dose at the center of the open field). Editable MLC offset tables are implemented in Pinnacle and most commercial TPSs that allow the user to define the leaf offset as a function of leaf position, which will shift the position of the leaf to align with the light field or radiation field for the purposes of dose calculations. In our clinic, during original machine commissioning, the TPS software's auto-modeling sequence was allowed to set the leaf transmission factor, and this factor was not based on physical measurement. In addition, the TPS has a tongue-and-groove width parameter, which governs the predicted interleaf leakage dose. Since the MLCi2 does not have a tongue-and-groove design, this width parameter was set to zero when the machine was originally commissioned. While theoretically correct, this causes Pinnacle to treat each MLC bank as if it were a solid slab, and there was no interleaf gap at all, which may lead to a significant underestimate of MLC transmission. Pinnacle provides a default rounded leaf offset table which is a light field-based offset table based on the geometry of the rounded leaf end, and this offset table in the TPS was never changed from its original default setting. Instead of optimizing the offset table in the TPS, physics staff calibrated the linac's mechanical leaf positions to dosimetrically match TPS as closely as possible in our clinic. [Figure 1] schematically shows how leaf position is determined in the TPS and the linac in our clinic. The IMRT quality assurance (QA) was performed for all IMRT plans in our clinic, and the average pass rate was between 95% and 98%. It is hypothesized the parameters governing MLC transmission, and the rounded leaf offset table are significant sources of inaccuracy in the TPS dose calculation, and they could be modified to improve overall IMRT dosimetric accuracy. 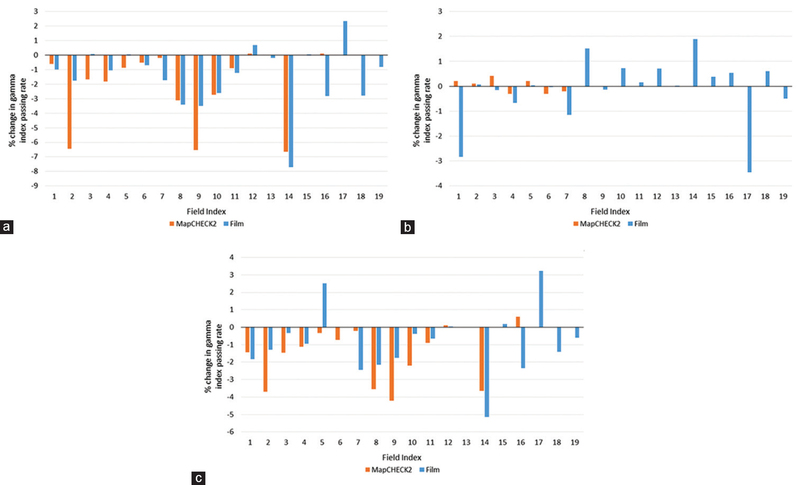 The purpose of this study was to improve the dosimetric accuracy of 6 MV IMRT dose distributions as calculated by TPS by changing the configuration parameters that govern Elekta MLCi2 transmission and rounded leaf offset in the TPS. We measured the transmission through the MLC with ionization chambers. A 10x10 cm 2 jaw opening was planned in the TPS to be delivered with an Elekta Synergy linac. For this work, the transmission is defined as the dose measured with the MLC leaf bank closed over the 10 × 10 cm opening relative to the dose measured with the MLC bank retracted behind the backup jaws. Ion chambers were placed at the depth of maximum dose in water equivalent plastic (1.6 cm) at two locations: Isocenter and 0.5 cm lateral to isocenter in the y-direction. Ion chambers were placed at isocenter because this lies directly underneath interleaf space, which will result in a more direct measurement of the interleaf leakage. Ion chambers were placed 0.5 cm lateral to isocenter in the y-direction because the projected width of each leaf is 1 cm in the isocentric plane, so measurements at this position will be placed directly underneath a leaf, resulting in a more direct measurement of the full leaf transmission. Two types of ionization chambers were used: The PTW Model N30013 Farmer-type ion chamber (PTW Freiburg, Freiburg, Gemany) and the Exradin Model A16 ion chamber (Standard Imaging Incorporated, Middleton, WI, USA). These ionization chambers were chosen because of their very different sensitive volumes (23.6 mm collector length for the PTW N30013 and 1.27 mm collector length for the Exradin A16). This allowed us to analyze volume averaging effect caused by the larger chamber. Once the MLC transmission was measured, the parameters in Pinnacle 3 TPS governing MLC transmission were adjusted to reflect these measurements. The rounded leaf offset table was measured and modified based on the similar work by Rice. The radiation field-edge position was measured using an IBA CC13 ionization chamber (IBA Dosimetry GmbH, Schwarzenbruck, Germany) to scan a profile across an 8 cm wide by 40 cm tall opening formed by the MLC banks. The backup jaws were moved to be 1 cm behind the leaf bank (when possible), so they would not impinge on the open field. The profile was normalized to the dose at the center of the field. The 8 cm wide field was delivered at all allowed integer leaf positions (-12 cm to 20 cm), and profiles were measured for all 33 resulting fields. The field edge positions for each profile were compared to corresponding TPS profiles calculated by Pinnacle 3, with the special condition that all the values in the TPS offset table had been set to zero. This was done because the difference between the measured and calculated radiation field-edge positions is the real offset for any given leaf position. A sample profile is shown in [Figure 2]. 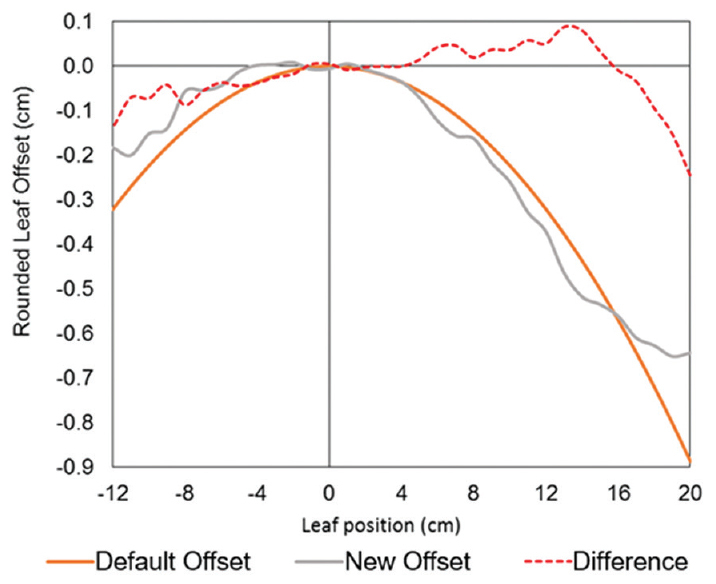 The 33 profile measurements were used to modify the offset values for both leaf banks, which were then averaged together and used in the TPS as the new leaf offset values. Modifications to the TPS configuration model were validated by performing IMRT QA on nineteen gantry static IMRT fields. All fields were previously delivered to patients in our clinic. Ten of the fields were originally used to treat breast patients, and nine were originally used to treat a lung patient. The delivery of the IMRT fields was measured with two modalities: The Sun Nuclear MapCHECK2 (Sun Nuclear Corporation, Melbourne, FL, USA) and Carestream EDR2 Film (Carestream Health Incorporated, Rochester, NY). The MapCHECK2 was used to replicate IMRT QA in our clinic, and EDR2 film was used because of its high spatial resolution. Both modalities measured planar doses at a radiological depth of 5 cm in water-equivalent plastic. For all 19 fields, the gantry angles were edited so that the fields were delivered straight down orthogonally onto the measurement plane at isocenter. The measured planar dose distributions were compared to the corresponding planar dose distributions calculated by the TPS. The agreement between calculated and measured dose distributions was evaluated using gamma index analysis. Gamma index analysis for the MapCHECK2 measurements was performed with SNC Patient version 6.2.2 software (Sun Nuclear Corporation, Melbourne, FL) while the radiographic film measurements were analyzed with RIT Classic version 6.3 software (Radiological Imaging Technology, Colorado Springs, CO, USA). The criteria used in the gamma index analysis were a distance-to-agreement of 3 mm, percent dose difference of 3%, a dose threshold of 10% of the maximum dose and Van Dyk option was on. Measured planar doses were compared to doses from four kinds of TPS calculations: Calculations performed using the default TPS configuration, calculations performed by the TPS with leaf transmission modified, calculations performed by the TPS with offset table modified, calculations performed by the TPS with both leaf transmission and offset table modified. [Table 1] shows the ion chamber measurements of the transmission through the MLC. Based on these measurements, the average transmission factor was found to be 0.005 ± 0.0005. Lafond et al. investigated the performance of the Elekta MLCi2 for volumetric-modulated arc therapy treatments and reported the transmission through the MLC to be 0.006, similar to our chosen leaf transmission value of 0.005. The leaf transmission factor in the TPS was changed from its current value of 0.001 to 0.005. The parameters in the TPS governing interleaf leakage were not changed for several reasons. First, there is a large variation in the amount of interleaf leakage transmitted through different interleaf gaps, which cannot be modeled by the TPS. Second, it is difficult to measure the leaf transmission and interleaf leakage separately. Any measurement of MLC transmission will contain contributions from both the leaf transmission and interleaf leakage. Finally, the parameters governing interleaf leakage are set for the entire machine in Pinnacle 3, not individually for different beam energies delivered with that machine. Hence, adding interleaf leakage through the MLCi2 for a 6 MV beam would also add the same interleaf leakage through the MLC for the 10 MV and 15 MV beams on the same machine. This is not physically accurate, as beams of different energies would be attenuated differently through the MLC. Hence, only the leaf transmission factor for the 6 MV beam was modified. 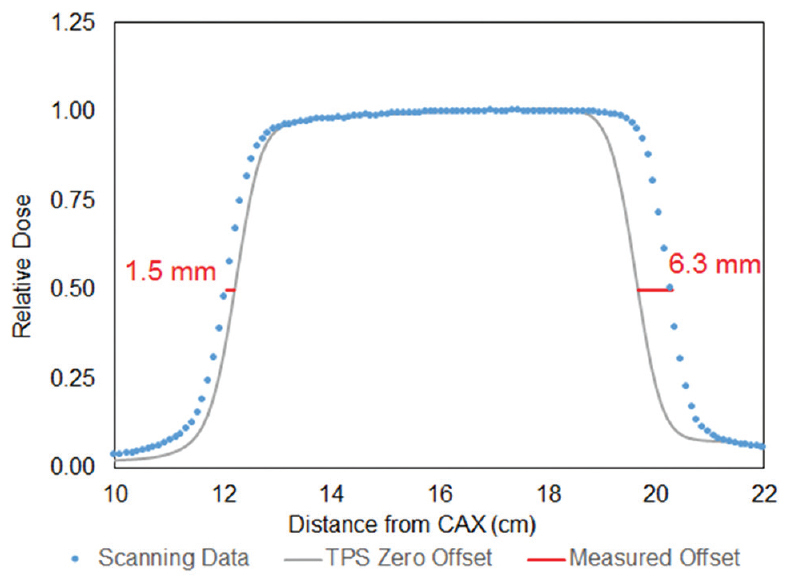 [Figure 3] shows the default light field offset currently used in the TPS, the measurement-based new offset values, and the difference between the two. There is not a large difference between the currently used light field offset table and the new offset table with an average difference of −0.2 ± 0.7 mm. The magnitude of the difference between the two is <1 mm for all measured leaf positions, except when the leaf was positioned at −12 cm, 19 cm, and 20 cm. This last leaf position had the largest difference of 2.4 mm. However, these extreme leaf positions are rarely seen in treatment plans, so these larger differences rarely affect treatment delivery. [Figure 4] shows relative changes in gamma index analysis pass rate for the 19 fields analyzed. After changing the leaf transmission value only [Figure 4]a, the MapCHECK2 results showed an average change in performance of −1.68% ± 2.36% (P = 0.006), while the film results showed an average change in performance of −1.48% ± 2.12% (P = 0.007). The results for both modalities showed that there was a statistically significant worsening in gamma index performance after modifying the leaf transmission value, according to the paired Student's t-test at a significance level of 0.05. After modifying the offset table only [Figure 4]b, the MapCHECK2 results showed an average change in performance of 0.01% ± 0.17% (P = 0.87) while the film results showed an average change in performance of −0.12% ± 1.28% (P = 0.68). The results for both modalities showed that there was not a statistically significant change in gamma index performance after modifying the offset table. After modifying both leaf transmission factor and the offset table [Figure 4]c, the MapCHECK2 results showed an average change in performance of −1.20% ± 1.53% (P = 0.003) while the film results showed an average change in performance of −0.81% ± 1.81% (P = 0.07). The MapCHECK2 results showed a statistically significant worsening of gamma index performance according to the paired Student's t-test while the film results did not show a significant difference. It is clear from this work that the default leaf transmission value currently used in the TPS significantly underestimates the transmission through the MLC. The current leaf transmission value, 0.001, is the minimum allowed value in the TPS. When the machine was originally commissioned in our clinic, it was left to Pinnacle 3's automatic beam modeling sequence to find the best parameters to fit Pinnacle 3's dose calculations to the measured commissioning data from the beginning to the end. Testing of Pinnacle 3's auto-modeling sequence found that it would indeed set the leaf transmission value to 0.001 based on the provided measured data. Although this is a relatively nonphysical parameter, Pinnacle 3 compensates the apparent dose in the tail regions by increasing the scattered radiation dose from the flattening filter. This results in a relatively good fit for all field sizes and depths. Changing only this leaf transmission parameter results in a statistically significant worsening of the gamma index performance of the IMRT plans unless the other parameters are changed too while it will be difficult to determine which other parameters need to be changed. There is limited capability to calibrate the mechanical leaf positions on the Elekta Synergy linac to agree with the default TPS offset table. According to Elekta, the machine does have its own hardcoded offset table, but this offset table cannot be viewed or edited. There are only two parameters to calibrate a leaf bank at all possible leaf positions: A slope parameter and an intercept parameter. Despite this limitation, our results show that the physics staff at out clinic did an excellent job of calibrating the linac leaf positions. This is illustrated by the fact that the new rounded leaf offset table is very similar to the current offset table used in the TPS, as illustrated by [Figure 3] and that modifying the offset table does not result in a statistically significant change in gamma index performance relative to MapCHECK2 and EDR2 film measurements of the patient IMRT plans we analyzed. Rice  used a similar method to optimize the rounded leaf offset table of the MLCi2 in the Philips Pinnacle 3 TPS. Rice's offset table is significantly different from the modified offset table developed in this work. The reason for this is the difference in linac MLC calibration protocol. In our clinic, the MLC positions are calibrated to maximize radiological agreement between measurements and TPS dose calculations. This is the reason that the modified offset table is not very different from the currently used offset table. The linac that Rice used in his paper was calibrated such that the radiation field edge locations would be coincident with the defined leaf position. That is to say, if the linac was ordered to place the leaf bank position at 5 cm, the leaf would be moved to a position such that the radiological field edge would fall at 5 cm from the central axis. This leaf calibration protocol has nothing to do with TPS calculations, which is why Rice's optimized TPS table ends up being significantly different from the default light field offset table in Pinnacle 3 for the MLCi2 treatment head. Although the parameters investigated in this work did not lead to an improvement in the overall performance of the TPS, this may not be the case for other clinical setups. Other clinics might use different approaches to commission their TPSs and likely used a combination of auto-modeling and manual adjustments. Because the auto-modeling is not completely done, the interconnection between all the parameters has not been established by the auto-modeler and optimizing one, or a few parameters will improve the overall accuracy due to physics modeling enhancements. The methods demonstrated here could be used for other clinics to investigate their setups. This work investigated the impact of MLC configuration parameters (leaf transmission, rounded leaf offset table) on the TPS dosimetric accuracy. In the setup used in our clinic, the currently used, though physically unrealistic, leaf transmission factor results in better performance than a more physically accurate leaf transmission factor. Modifying the offset table did not significantly affect the performance of IMRT QA because current clinical MLC calibration protocol achieves excellent radiological agreement with the current TPS, and there is little room for improvement. These results are relatively narrow in scope because they are affected by the current clinical protocols, the machine and treatment head used, the beam energy, and the TPS used. However, different clinics could potentially achieve significantly different results using the methods and techniques described in this work, and there could be room for improvement of dosimetric accuracy through optimization of the rounded leaf offset table and MLC transmission parameters for other clinics. This work was supported by National Cancer Institute Award K22CA204464, Louisiana State University (LSU) Economic Development Assistantship Award and LSU Faculty Research Grant. Boyer A, Biggers P, Galvin J, Klein E, LoSasso T, Low D, et al. AAPM Task Group Report No. 50: Basic Applications of Multileaf Collimators. Madison, WI: Medical Physics Publishing; 2001. Vial P, Oliver L, Greer PB, Baldock C. An experimental investigation into the radiation field offset of a dynamic multileaf collimator. Phys Med Biol 2006;51:5517-38. Rice JR. Optimization of the rounded leaf offset table in modeling the multileaf collimator leaf edge in a commercial treatment planning system. J Appl Clin Med Phys 2014;15:4899. Lafond C, Chajon E, Devillers A, Louvel G, Toublanc S, Olivier M, et al. Impact of MLC leaf width on volumetric-modulated arc therapy planning for head and neck cancers. J Appl Clin Med Phys 2013;14:4074. Cadman P, McNutt T, Bzdusek K. Validation of physics improvements for IMRT with a commercial treatment-planning system. J Appl Clin Med Phys 2005;6:74-86.